As the latest iPad model from Apple, the iPad Air has aroused a lot of interest in people from around the world. It weighs only one pound so it is quite handy and perfect for those who enjoy watching movies on a portable device. So far, Apple has made a great contribution on multimedia enjoyment. However, all the iPad models (no matter iPad Air, iPad Mini 2, iPad 4, the new iPad, iPad 2 or the original iPad) cannot play your Blu-ray movies directly. Of course, most of us are not pay iTunes' ridiculous prices to watch movies and TV shows we already own on Blu-ray discs. Instead, we'll just rip those Blu-ray to an iPad-friendly format like MP4, MOV or M4V. There is a number of Blu-ray ripping software available to help you convert Blu-ray videos if you want to play them on iPad Air (or iPad Mini 2, iPad 4, etc.). These software programs vary, so you might be confused when you have to choose one. If so, you are recommended to use EaseFab Blu-ray to iPad converter. It is rated as the best solution out there to watch Blu-ray movies on iPad. It's a complete Blu-ray converter that you can use to rip your Blu-rays and DVDs to nearly any iPad model supported audio or video formats such as MP4, MOV, M4V, MP3, M4A and much more. This Blu-ray converter for iPad can copy entire Blu-ray and DVD movie to any iPad with extremely fast speed while preserve the original high quality. All these can be done in just a few simple clicks. The Blu-ray to iPad converter is easy to use. Following the intuitive interface, even a novice can finish ripping Blu-ray movies in just a few clicks! As a versatile Blu-ray ripper for iPad, it can stream not only Blu-ray and DVD to specific devices like iPad Mini, iPad Pro, iPad Air, iPhone, Apple TV, but also rip Blu-ray to iPhone (iPhone XS, iPhone XS Max, iPhone XR, iPhone X, iPhone 8, iPhone 8 Plus, etc. 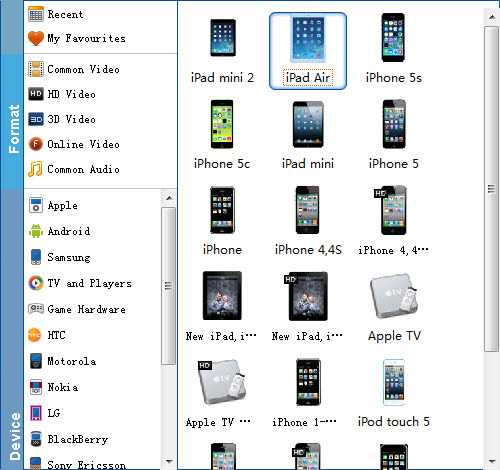 ), iPod (iPod Touch 5) and many other popular video/audio format like WMV, AVI, FLV, 3GP, MKV, AIFF, AAC, and more. Play Blu-ray on Android tablet or smartphones is also a simple case with this Blu-ray converting tool. Now just get it and follow the step-by-step guide to finish the Blu-ray to iPad conversion. Insert the Blu-ray disc to the Blu-ray Disc drive or DVD to the DVD-ROM and click the "Load Disc" button to have movies uploaded to the program. Here you can also import DVD folders, ISO files and IFO files to convert. At the bottom, you can select your desired subtitle and audio track. Choose your iPad model from the Apple devices output preset as the output format, which will remove all the incompatibility issue for you. Note that you can customize the settings for the output by specifying format and destination folder. When you have finished all the above settings, you can simply click the Convert button on the main interface and let the software do the Blu-ray to iPad conversion for you. All the conversion tasks will be done at fast speed and you will get a high output quality. When you complete the process and rip Blu-ray to iPad, you can connect the device to your computer to sync the iTunes library. From here, you are ready to enjoy your high quality videos on iPad Air or iPad 4, iPad mini, etc. Step 4. Select the file and click "Open". After opening the file the will go to your iTunes and you can verify if the transfer has been successful by going to the iTunes library and typing the name of the file. If it is successfully transferred, A thumbnail of the video file will appear in your screen. If the transfer is successful you can further transfer the file to your iPod Touch, the new iPad Air, iPad Mini, iPad 2, iPhone 5S, iPhone 4S, Apple TV 3 and other portable devices and you can easily enjoy them everywhere you wish to.